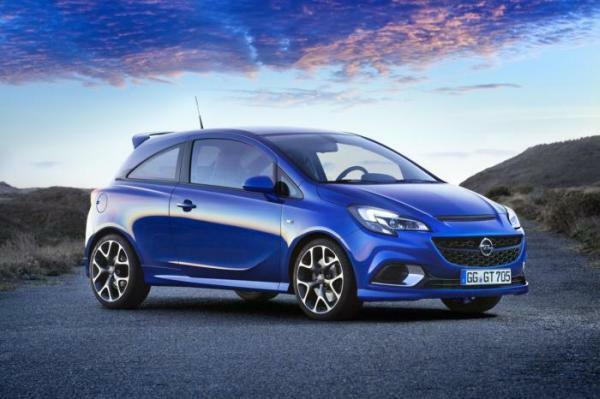 Opel has announced the 2015 Corsa OPC will be priced from €24,395 - including VAT - in Germany. Currently available to order, the high-performance hatchback has a turbocharged 1.6-liter four-cylinder engine that produces 207 PS (152 kW) and up to 280 Nm (206 lb-ft) of torque with overboost. It is connected to a six-speed manual transmission which enables the car to accelerate from 0-100 km/h in 6.8 seconds before hitting a top speed of 230 km/h (143 mph). In terms of fuel efficiency, the model returns 7.5L/100 km (37.6 mpg UK / 31.3 mpg US) with CO2 emissions of 174 g/km. Besides the powerful engine, the OPC features a unique front fascia with bi-xenon headlights and LED daytime running lights. The model also has extended side skirts, a tailgate-mounted spoiler and 17-inch alloy wheels. Moving on to the interior, there's a flat-bottom steering wheel, Recaro performance seats and stainless steel pedals. Other notable highlights include revised instrumentation and a six-speaker audio system with Bluetooth and USB connectivity. The latter can be replaced by an optional IntelliLink infotainment system for an additional €300. Speaking of options, customers can order an OPC Performance Package which adds Brembo brakes, a locking differential and 18-inch alloy wheels. There's also a Carbon Package which adds faux carbon fiber trim to the grille and mirror caps.